BLM plan ignores key causes of large wildfires in this delicate ecosystem. In winter 2017, the Bureau of Land Management (BLM) began preparing two environmental impact statements to review the environmental consequences of creating a region-wide series of “fuel breaks” that will add thousands of miles of new linear non-sagebrush habitat across the Great Basin portion of Nevada, Idaho, Oregon and Utah. 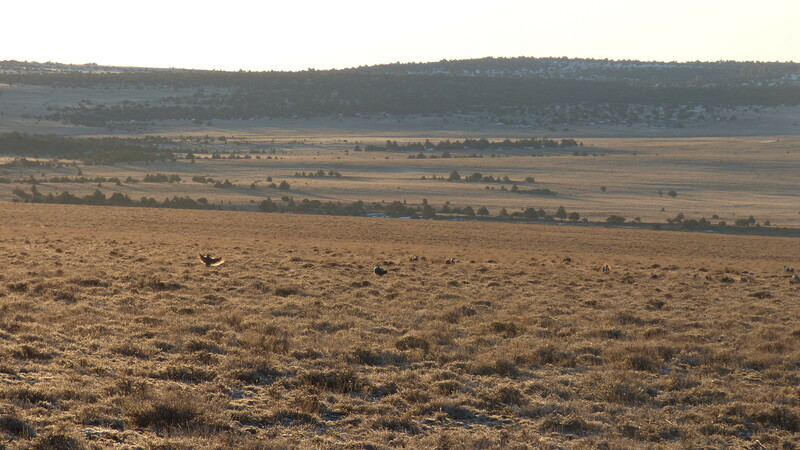 Endangered sage grouse at a sagebrush lek in southern Oregon. The creation of a massive network of linear pathways in the sagebrush steppe likely will not preclude large fires and will have serious impacts on sagebrush ecosystems. Photo by Larisa Bogardus/BLM . BLM’s Idaho division just released the final approval for its project proposal that, among other things, will implement massive juniper/sagebrush removal over 617,000 acres. Together, the Idaho and Oregon projects will put fuel breaks along 271 miles of roads in the sagebrush region. The goal of fuel breaks is to reduce large wildfires in sagebrush habitat. Under natural conditions, sagebrush burns at anything from 50 to 400 year intervals depending on the sagebrush type. However, the frequency of fires has increased, and the interval between wildfires has shortened. Wildfires are now one of the threats to the sagebrush ecosystem and dependent species like the endangered sage grouse. One is climate change, which the Trump administration denies is real. Yet there is abundant evidence that large wildfires are a direct consequence of warm, dry conditions. The second factor leading to greater wildfire occurrence is livestock grazing. It' s a bit nuanced, but livestock grazing facilitates the expansion of flammable exotic grasses like cheatgrass. Livestock enhances cheatgrass germination and survival by destroying biocrusts that cover undisturbed soils and alternatively weakening native bunchgrasses by chomping away at them, weakening their ability to compete against exotics like cheatgrass. Because the BLM is prohibited from discussing the proximate factors contributing to larger wildfires, it is instead proposing measures to deal with the wildfires that are inevitable. This is somewhat analogous to medical doctors recommending radiation to treat a chain smoker’s lung cancer and never doing anything about the source of the cancer-cigarette smoking. The second method is to bulldoze and herbicide a strip of land on either side of a road to kill all vegetation. This disturbance of soils enhances the spread of cheatgrass, so in effect, just creates a more burnable buffer zone. The elimination of native vegetation and the disturbance created by fuel breaks tend to enhance the spread of exotic weeds. One study in California found a 40 percent increase in exotic annuals along fuel breaks. Another unmentioned issue with all of these fuel break strips is that off-road vehicle enthusiasts like to ride them, and in the process disturb the soil and spread the seeds of weeds.